The Hall of Residence of Eibar Educational Complex is qualified as a Public Center, depending for all purposes of the Department of Education, Universities and Research of the Basque Government. 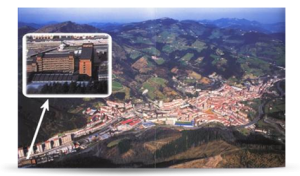 It is located in the town of Eibar, in the province of Gipuzkoa, outside the town (to the west) next to the N-634 road (Bilbao – San Sebastian), and right in the boundary with the Province of Bizkaia. The Center is focused on teaching and living together, The Hall of Residence is intended, preferably, to the guidance and personal attention of pupils living there. Located in an appropriate environment, it allows optimizing the academic performance, having services that fit the needs of the educational activity. It serves as a supplement to the main educational activity that pupils develop in the corresponding Training Centers. Endows to the Region of the Bajo Deba and neighboring areas of an accommodation center and services capable of responding to the needs arising from the different cultural, social and sportive activities of the Region. It participates in the growth of the five key areas of development in the Shire: research, education, culture, business and civil society.